For a limited time new Banlaw customers can try a set free for 30 days! Terms and Conditions apply. Banlaw’s mechanical tank overfill protection systems help mining, construction, and rail companies that need to refuel diesel-powered machines efficiently and safely. They achieve this by avoiding productivity loss from underfills, overfills, and tank damage while delivering substantially higher flow rates under normal operating conditions. Banlaw FillSafeTM Zero tank overfill protection systems are the benchmark in pressureless fast fill systems. The unique patent pending* design is energised by the flow of fuel, which means no external power source is required, no specialist skills are needed to install, and the system is also cost-efficient when compared with other options. No pressure build up in the tank – prolongs equipment life and avoids tank splits and spills. Consistently accurate tank filling to your specified levels – the system automatically terminates fuel flow once the tank is full, so no overfilling of machines, and no break downs from accidental underfills. Exceptional fill speed – 200lpm (53gpm) all the way up to 1000lpm (264gpm). Superior flow characteristics – Unlike some competitor systems, Banlaw has designed FillSafe Zero as a single package (i.e. Dry Break refuelling and overfill prevention in one integrated solution). This means optimised fuel flow, and very low pressure-drop through the Flow Control Valve which ensures higher refuelling flowrates without premature nozzle shut-off. Reliable – incorporates both primary (pressure-less) and secondary (pressured backup) overfill protection to ensure tank filling is stopped automatically, every time. Operators can initiate a refuelling event, and then invest their time in other important maintenance tasks. Suitable for most tanks – the range of product options in the FillSafe Zero family means almost all industrial machines and small to medium diesel storages can be fitted with this system. Simple installation – fitting the 2” Flow Control Valve and Venting Level Sensor requires no hot-work or external modifications to tanks (easy retrofit). Single Pilot Line – only a single pilot (signal) line is required, with the option of routing the line either internally or externally to the tank(s). 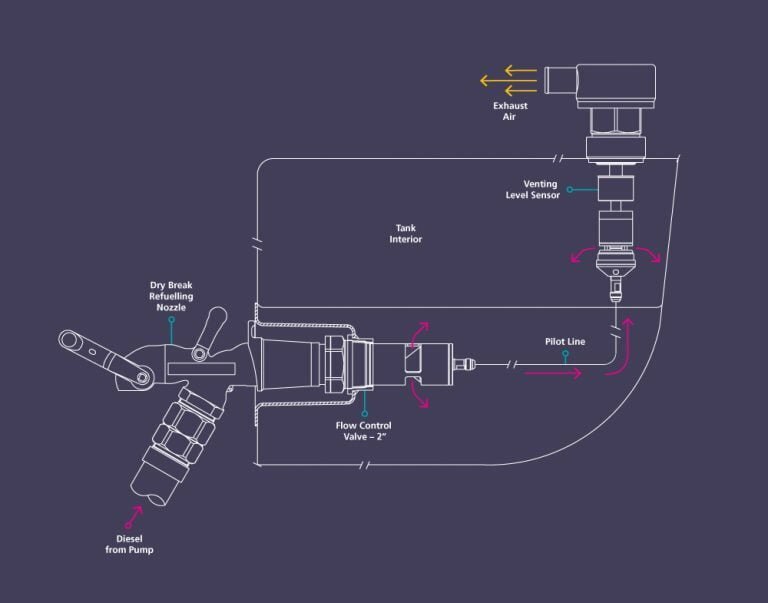 Works with your existing refuelling hardware – our Flow Control Valves with their integrated Dry Break Receivers have been configured to operate reliably with the widest possible range of Banlaw and other-brand Dry Break refuelling nozzles. Less sprays, slips, and falls – operators do not need to stop refuelling, check how full the tank is and continue. FillSafe Zero ends the refuelling event automatically. This reduces the instances of staff getting hurt when climbing on equipment, and dramatically speeds up the process. Customise to your requirements – if your tank requires a non-standard ullage, or your deployment is of more complex design, contact the specialists at Banlaw to discuss a solution specific to your needs. 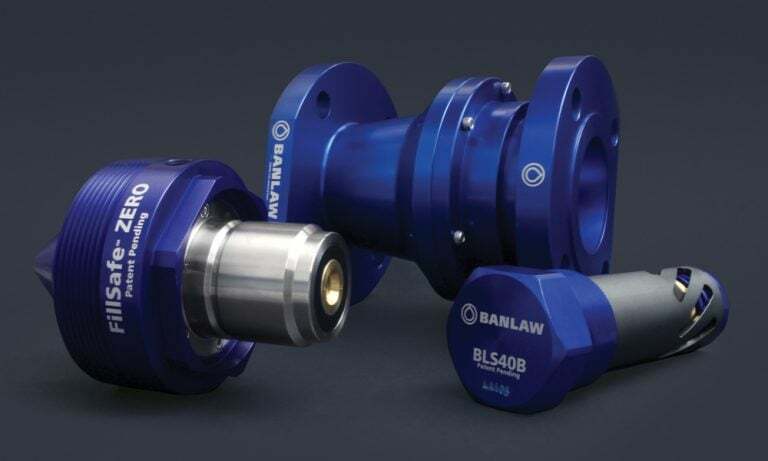 Compatibility – Banlaw FillSafeTM Zero Flow Control Valves and Level Sensors can be used (interchanged) with a variety of competitor OFP products. Contact Banlaw or your nearest authorised Banlaw distributor for further information. A Banlaw FillSafeTM Zero pressureless fast fill system consists of a Flow Control Valve, a single Pilot Line, and a Level Sensor. Diesel passes through the Flow Control Valve prior to entering the tank. The Level Sensor, which is connected via the Pilot Line causes the flow to be terminated at the specified ullage. The FillSafe Zero architecture is highly flexible. Customers can mix-and-match the various Flow Control Valve and Level Sensor options to suit their specific requirements, including multiple tanks on the same machine, remote mounting, tank venting requirements, and cost minimisation. 200lpm (53gpm) to 800lpm (211gpm) diesel flow rates supported. 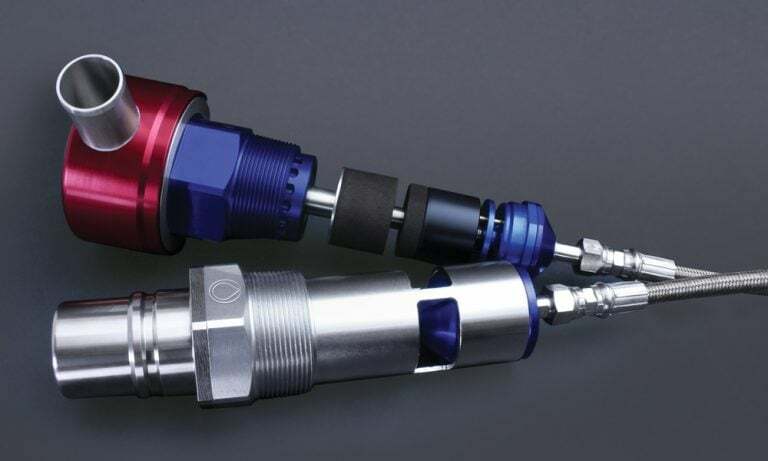 2” NPT (M) outlet thread – most often encountered connection for filling diesel fuel tanks. Fits into a standard receiver shell (i.e. recessed refuelling point). Integrated Banlaw Dry Break 23 series receiver to suit Banlaw 800 series and other industry compatible nozzles. Optional Banlaw FuelTrackTM Auto ID receiver for Fuel Management System integration. 200lpm (53gpm) to 1000lpm (264gpm) diesel flow rates supported. 4” NPT (M) outlet thread, allows increased flow and quick changeout of the Aeroquip system installed on some diesel locomotives. Choice of Banlaw Dry Break 23 series receiver, Rail-spec receiver, or the larger 43 series for maximum flow rate capability. 200lpm (53gpm) to 1000lpm (264gpm) flow rates supported. Flanged and threaded process connections available to support installation of the Flow Control Valve directly on the tank, or remotely. Can be deployed up to 10 metres from the Level Sensor. This version of the product allows easy integration with pipework, hoses and couplers of all types (Camlock, API, etc.). Terminates refuelling or filling at the nominated tank ullage with no pressure build-up in the tank. Will trigger pressure shut-off backup system when deployed with Banlaw (or similar) Tank Vent, plus Dry Break Refuelling Nozzles and Receivers. Requires tank venting to occur via a separate port/arrangement. Option of either internal or external Pilot Line ports mean the Venting Level Sensor can be deployed with any FillSafe Zero Flow Control Valve (mix-and-match). Vents up to 1000lpm (264gpm) of exhaust air when filling is in progress. Unique flotation mechanism allows the Dry Break refuelling system to serve as a ‘pressurised tank’ secondary means of tank overfill protection. Pressure relief feature ensures no tank damage occurs if pressure shut-off backup system is used. Venting Level Sensor is sold with 16psi (110kPa) or 7psi (49kPa) configuration to support various tank wall thicknesses. ‘Anti-spill’ rollover protection feature is highly reliable, and will not allow significant amounts of diesel to escape should the equipment end up on its side, or roll over completely. Can be deployed with optional remote mounted filter breather system. Banlaw 3µm (abs.) Ultra Fine Filtered Vent is recommended. Banlaw FillSafeTM Zero Pilot Lines are provided in a range of lengths to suit your specific equipment installation scenario. They have been correctly specified for constant immersion in diesel fuel, and the stainless-steel braid improves resilience and reduces hose damage from bumps and scrapes prior to or during system installation. 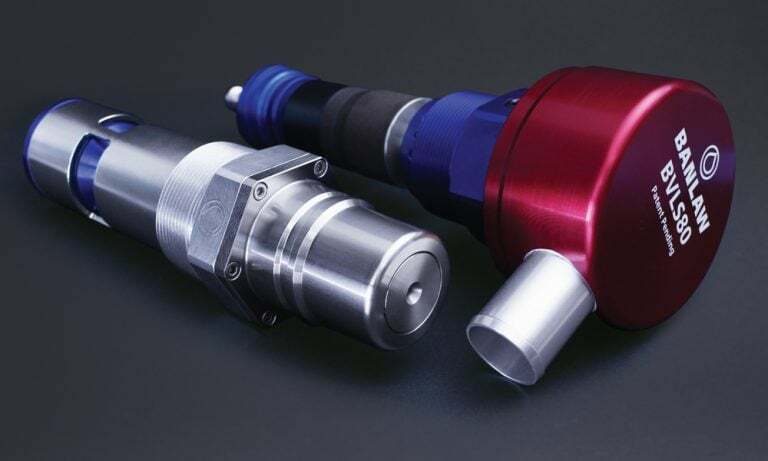 Weld-mount, bolted or magnetic hose clamps can also be provided to help secure the Pilot Line. Contact Banlaw today for safer, faster, and more reliable filling of diesel tanks on your work site. Following the success of the field trial, and subsequent multi-tank installations of FillSafe Zero, the solutions deployed for the Cowal Gold Mine have now been distilled into standardised and integrated Banlaw refuelling and overfill protection products. We’ve been creating premium-quality solutions for liquid transfer, measurement, and control for 37 years. With well over 500 products in this catalogue spanning Refuelling, Fluid Transfer, Overfill Protection, and Fuel Management, we’ve got you covered. FillSafe Power is an electronic overfill protection system suitable for a wide range of fluid types, flowrates, and a variety of tank refilling or refuelling applications.